The gruesome violence associated with the drug war has done grave damage to Mexico’s global image, and potential tourists searching for a sunny, safe vacation cannot overlook the 50,000 drug-related homicides that have been committed throughout the past six years. Tourism accounts for nine percent of the country’s GDP and provides 2.5 million jobs for Mexican citizens. The importance of sustaining this industry is twofold in that it is not only an important sector of the economy, but also a shrinking tourist industry will come with the cost of already scarce jobs, with the unemployed being inclined to resort to the illicit drug market as a source of income. The year 2009 proved to be a low point for tourism in Mexico, but since then, President Felipe Calderón’s administration’s attempts to protect this key industry have led to positive and visible results. Despite the drug war’s widespread violence and Mexico’s besmirched image, the tourism industry has continued to perform in spite of the persistent violence. According to former Foreign Minister Jorge Castañeda, drug-related violence has plateaued at a relatively high level but is not increasing, with a steady 1,000 drug-related homicides per month, which eventually could prove to be a disaster to the Mexican economy. (1) Although foreign media networks tend to concentrate on the violence in Mexico, the rate of homicides per every 100,000 people in Mexico is still less than Venezuela, El Salvador, Colombia, and Brazil. (2) The violence, however, is not prevalent in every region of the country, but is limited to specific areas; nonetheless these areas are continuously shifting. Frequently, when a declining homicide rate is observed in one town, the crime merely disperses itself, and an increase in murders are to be found in several nearby communities. For example, when the number of murders in Juarez began to even out, the murder rates in Chihuahua city, just a few miles away, began to increase. (3) This pattern could prove disasterous for the Mexican economy, as the uncertainty of where the violence might spread will leave tourists reluctant to travel. In the past few years, the northern border has suffered the most from drug-related violence and decreasing tourist numbers. The number of US tourists driving over the border to the once tourist-filled towns in the north hit a record low in 2011, decreasing from approximately 80 million in the early 2000’s to less than 60 million in 2011. Prior to the drug war, border towns were popular for Americans taking both day and overnight trips. However, the north saw a decrease in homicides in 2011, which is opening up to possibility for tourism once again. In 2010, 50% of drug related murders occurred in the northern-border states, while in 2011 only 44% occurred along the six-state border. The most notable drop occurred in the northwest states (Chihuahua, Baja California, and Sinaloa) where murders decreased by a third. This sharp decrease is attributed to the Sinaloa cartel’s increased control of the area but also to improved local police forces. (4) Tourism in Tijuana, Baja California, suffered severely as a result of the violence in 2009 and 2010, but the city is revitalizing its arts, gastronomy, and tourism as crime is decreasing and dispersing itself to the hillside neighborhoods outside the city. (5) In 2011, the two most popular tourist destinations, Tijuana and Juarez, located only a few miles south of the American border, both sponsored festivals to celebrate the decreasing crime rates with the intentions of regenerating tourism. Although driving across the border has become less popular, flights to Cancun and Mexico City are actually at record highs, and the ministry of tourism has reported that flights carrying international tourists are expected to increase 9-10 percent this year. (7) Since the drug war began, airlines, such as Virgin America, South West/Air Tran, and Princess, have added new flights and numerous hotels have been built in major tourist destinations across the country. (8) The violence has seemed to steer clear of the most popular tourist destinations and resort cities, like Cancun, Puerta Vallarta, and Los Cabos, which all have had increasing numbers of tourists from a broad international base. Mexico saw the lowest number of tourists in 2009, with a 15 percent plunge in tourist revenue as compared to 2008. This was likely caused by a surge in violence, the outbreak of the H1N1 virus, and the recession. However, President Calderón’s administration has worked hard during the past few years to reverse this trend. 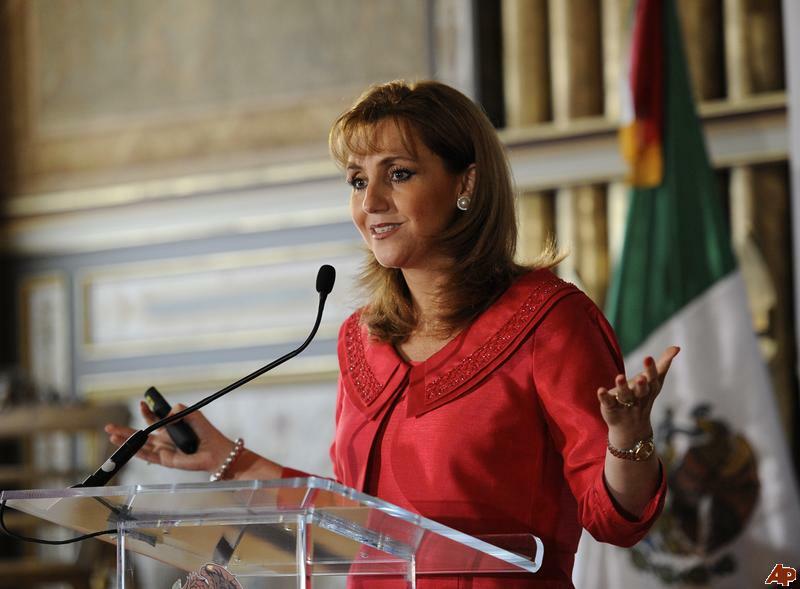 Not only did Calderón directly involve himself as a promoter for the country, but he also appointed Gloria Guevara as secretary of tourism in 2010. Her creative promotion of tourism both nationally and internationally has helped to keep tourist numbers steady. Guevara’s strategy was to appeal to a broader base of tourists, rather than overly relying on the United States market. Guevara said in an interview with Reuters, “We are diversifying by promoting culture and gastronomy and broadening the base of nationalities that visit. Before we were too dependent on the U.S., and sun and sand.”(9) The increased number of travelers arriving from 141 countries, especially from Brazil and Russia, is evidence of this strategy’s success. (10) Guevara also broadened appeal by setting up more than 20 historical routes through pueblos, even in violent-prone areas. The travel advisories issued by the U.S. State Department and Texas Department of Public Safety pose another obstacle to tourism. Guevara and the chief operating officer of tourism, Rodolfo Lopez Negrete, have met with Texan state officials and pursued a closer relationship with the American government, which Guevarra comments is now “better than ever.”(12) Texas, on security grounds, has issued advisories discouraging travel to Mexico for spring break for the last three years. Lopez Negrete asserted to Texan officials that “those pockets where the violence is taking place are very well identified” and that tourists were not the targets of drug-related crime. (13) The current U.S. State Department advisory urges against “non-essential travel” to 16 of Mexico’s 31 states, and cites that reason for the advisory is the increase from 35 murders of U.S. citizens murdered in Mexico in 2007 to 120 murders in 2011. (14) It should be noted that the majority of the murders occurred along the US border and several victims were permanent residents of Mexico at the time. (15) Lopez Negrete commended the U.S. advisory for specifying which regions were dangerous, noting that many resort cities are outside of the danger zone. The ministry of tourism in Mexico has implemented a multi-faceted approach to promote tourism and has been successful in reviving the industry. Newly elected President Enrique Peña Nieto has not yet announced his nomination for the Minister of Tourism, however it is not uncommon in Mexico for tourism ministers to span administrations in Mexico, and it would be wise for Peña Nieto to consider re-appointing such a successful Minister of Tourism. At a tourism conference in Riviera Maya in May, Peña Nieto said that he intended to set up a new tourism fund to improve tourism infrastructure and create new destinations. (16) But most importantly, Peña Nieto has made promises to reduce violence and poverty. These are two things that would improve the country’s image and encourage tourism independent of any marketing scheme. Successful promotion of tourism has sustained the industry through the Calderón administration, and as long as the violence stays at steady or decreasing levels during the next administration, tourism should continue to thrive. (1) “Mexico’s Drug War: No Sign of light at the end of the Tunnel.” World News on NBC News. May 14, 2012. Accessed July 16, 2012. http://worldnews.msnbc.msn.com/_news/2012/05/14/11698166-mexicos-drug-war-no-sign-of-light-at-the-end-of-the-tunnel?lite. (3) “Mexico’s Drug War: No Sign of light at the end of the Tunnel.” World News on NBC News. May 14, 2012. Accessed July 16, 2012. http://worldnews.msnbc.msn.com/_news/2012/05/14/11698166-mexicos-drug-war-no-sign-of-light-at-the-end-of-the-tunnel?lite. (4) Dibble, Sandra. “Violence Down on Mexico’s U.S. border.” UT San Diego. Mar 2, 2012. Accessed July 24, 2012. http://www.utsandiego.com/news/2012/mar/02/report-drug-violence-lessening-tijuana-other-borde/?page=1#article. (5) O’Connor, Anne-Marie. “In Tijuana, Taking a Risk on a Turnaround.” Washington Post viagra senza ricetta. Oct 8, 2011. Accessed July 24, 2012. http://www.washingtonpost.com/world/americas/in-tijuana-taking-a-risk-on-a-turnaround/2011/10/05/gIQARhsSWL_story_1.html. (6) Associated Press. “Mexican Army Says Killings in Border City of Ciudadd Juarez Down 42 percent.” Fox News. July 11, 2012. Accessed July 30, 2012. http://www.foxnews.com/world/2012/07/11/mexican-army-says-killings-in-border-city-ciudad-juarez-down-42-percent. (7) Bryan, Victoria. “Mexico Seeks new Tourists Despite Drug War.” Reuters. May 23, 2012. Accessed July 16, 2012. http://www.reuters.com/article/2012/05/23/us-mexico-tourism-idUSBRE84M1AA20120523. (8) Reynolds, Christopher. “How Mexico’s Drug War Affects Tourism.” Los Angeles Times. Dec 26, 2010. Accessed July 16, 2012. http://articles.latimes.com/2010/dec/26/travel/la-tr-mexico-20101226. (9) Bryan, Victoria. “Mexico Seeks new Tourists Despite Drug War.” Reuters. May 23, 2012. Accessed July 16, 2012. http://www.reuters.com/article/2012/05/23/us-mexico-tourism-idUSBRE84M1AA20120523. (10) Walczak, Alexa. “Surprised? Tourism to Mexico Continues to Increase, Despite Rick Perry’s Warnings.” Chron.com Jul 24, 2012. Accessed July 24, 2012. http://blog.chron.com/txpotomac/2012/07/surprised-tourism-to-mexico-continues-to-increase-despite-rick-perrys-warnings. (11) Delsol, Christine. “The Future of Mexico Tourism” SFGate. July 4, 2012. Accessed July 17, 2012. http://www.sfgate.com/mexico/mexicomix/article/The-future-of-Mexico-tourism-3682683.php. (12) Walczak, Alexa. “Surprised? Tourism to Mexico Continues to Increase, Despite Rick Perry’s Warnings.” Chron.com Jul 24, 2012. Accessed July 24, 2012. http://blog.chron.com/txpotomac/2012/07/surprised-tourism-to-mexico-continues-to-increase-despite-rick-perrys-warnings. (13) Forsyth, Jim. “Texas Warns Against Spring Break Travel to Mexico.” Reuters. Mar 7, 2012. Accessed July 19, 2012. http://www.reuters.com/article/2012/03/07/uk-usa-texas-mexico-idUSLNE82600W20120307. (14) Ramirez, Roberto. 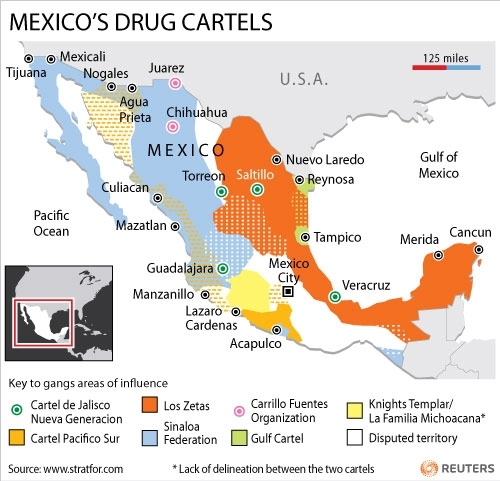 “Mexico’s Drug War Rocks U.S. Expat Stronghold.” Reuters. July 17,2012. 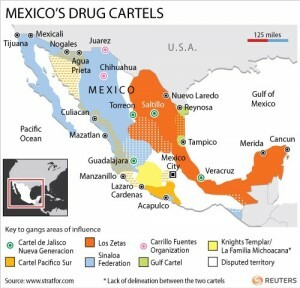 Accessed July 18, 2012. http://www.reuters.com/article/2012/06/18/us-mexico-drugs-idUSBRE85H00320120618. (15) Althaus, Dudley and Lise Olsen. “Number of Americans Killed in Mexico Continues to Rise.” Chron.com. April 29, 2012. Accessed July 24, 2012. http://www.chron.com/news/houston-texas/article/Number-of-Americans-killed-in-Mexico-continues-to-3518659.php. (16) Delsol, Christine. “The Future of Mexico Tourism” SFGate. July 4, 2012. Accessed July 17, 2012. http://www.sfgate.com/mexico/mexicomix/article/The-future-of-Mexico-tourism-3682683.php. ← In the Wake of Rio+20, Will Brazil Walk the Talk? Is Microcredit the Answer or an Answer for Latin America?